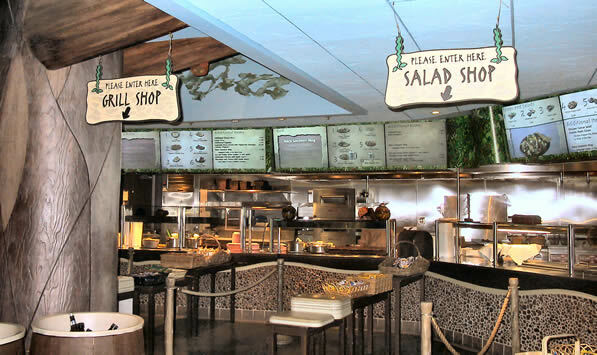 With sweeping views of the 33-acre savanna that features free-roaming animals and birds, Disney's Animal Kingdom Lodge celebrates not only Africa's wildlife, but also its art, food and culture. Discover authentic African architecture and design, from thatched ceilings to hand-carved wooden furniture. The lobby showcases a large mud fireplace and natural lighting design, which accentuates breathtaking sunrises and sunsets. At night, the Savannah is lit by artificial moonlight. African story-telling takes place each night around the firepit at 7:30 p.m.
1-4 p.m. at Simba's Cubhouse, and costs $70 plus tax ($20 goes to Wildlife Conservation Fund). You can make reservations by calling 407-WDW-DINE. 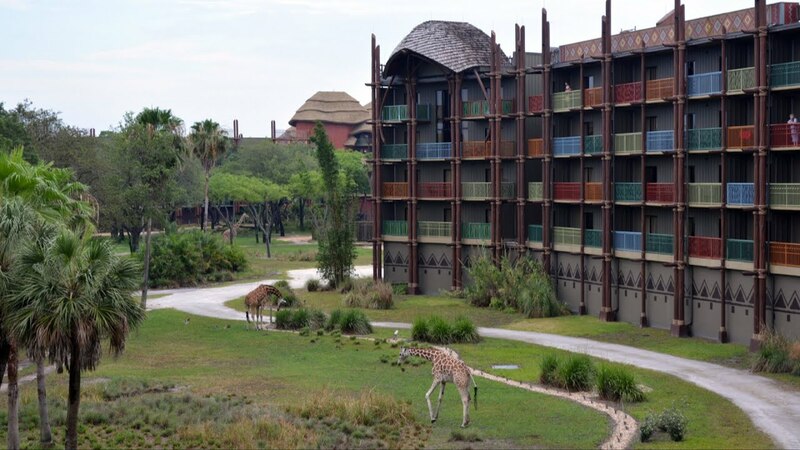 Disney's Animal Kingdom Lodge is designed to encourage observation of Africa's amazing wildlife from either the comfort of your room or common vistas throughout the resort. Please refrain from feeding the animals or dropping items into the habitats. While at Disney's Animal Kingdom Lodge, please do not attempt to cross the barriers designed for guest and animal safety. If any guests attempt to harm the animals or their habitats, they will be immediately asked to leave the resort. There are three separate savannahs. These savannahs can be viewed from Sunset Overlook, an overlook near Uzima Pool, alcoves along Kudu Trail (second floor, rocking chairs, high-powered binoculars) and Zebra Trail, and the Kopje (a large observation area that extends into the savannah. Stop by and talk to the Lobby Greeters, Savanna Guides or Restaurant Greeters, as they are Cultural Representatives from Africa and love to share more about their homeland. Also, there are activities throughout the resort to allow you to learn more - contact Guest Services for more information on these activities. The Bust Stop is located outside, adjacent to the front entrance. 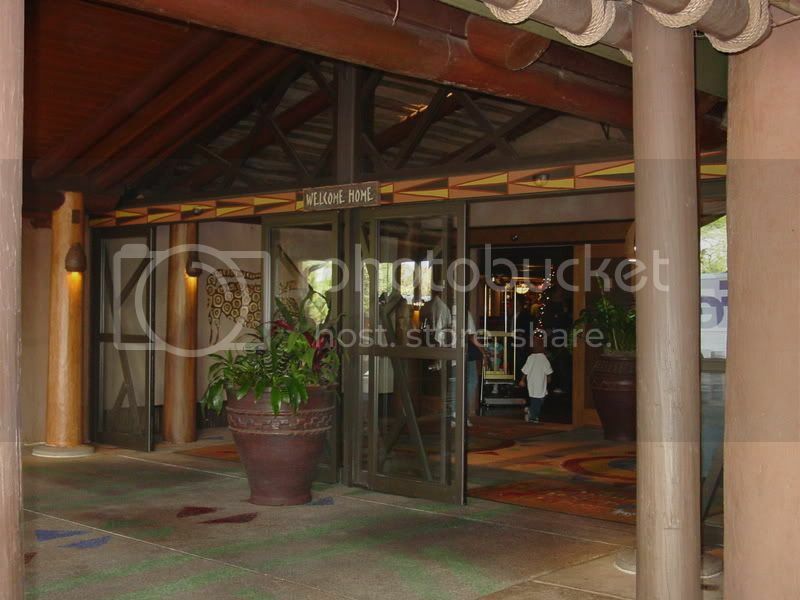 From the entrance of the lobby, exit the building. Follow the covered walkway on your left to the Bus Stop. 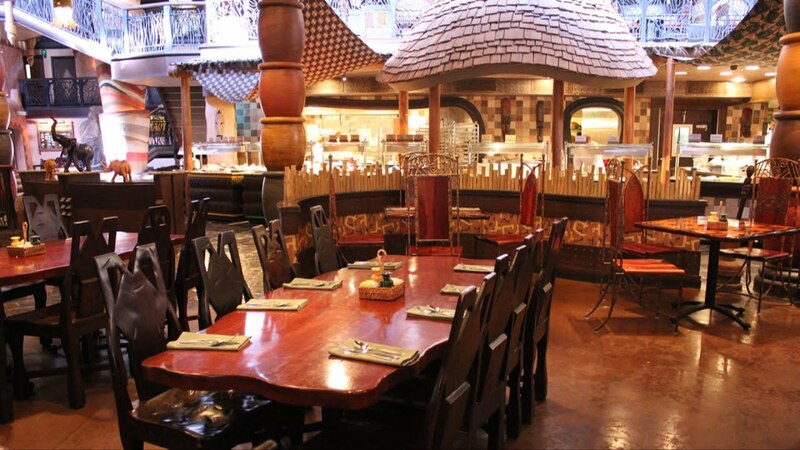 Boma - "Flavors of Africa" captures the essence of a vibrant African marketplace. Savor the unique African dining experience, influenced by many cultures, in this family restaurant. Offering a buffet for both breakfast and dinner, Boma features an exhibit kitchen, wood-burning grill and rotisserie, all under traditional thatched roofs. Breakfast is served from 7:00 a.m. to 11:00 a.m.
Dinner is served from 4:30 p.m. to 10 p.m. Priority seating suggested. Call up to 120 days in advance. Meal Plan accepted - 1 dining credit. Jiko - "The Cooking Place" is a casual restaurant that features Modern African Cuisine with vibrant stylish atmosphere and an exclusive South African wine list. Focusing on simple and light cuisine, Jiko exudes spirit and refinement with an emphasis on the freshest ingredients. With twin wood-burning ovens as its icon, Jiko's design represents an abstract perspective of Africa. Appetizers cost approximately $10.50 to $19.25. Dinners run approximately $30.50 to $55.00. Desserts are about $11.00 to $18.00. Jiko also offers a variety of specialty teas, which range from $5.95 to $6.89, and they also serve a wonderful Zebratini, and boast the largest selection of African wines outside Africa. The Mara - fast food from a food court. You can get Tandoori chicken pizza, salads, sandwiches and other quick food items here. Open 6:30 a.m. to 11:30 p.m.
Victoria Falls - Overlooking Boma, is the perfect spot to enjoy specialty coffees, teas, and a variety of beverages throughout your stay. Relax with family and friends in these spirited surroundings and soak up the rich heritage of Africa. Open 4:30 p.m. to 12:00 midnight. 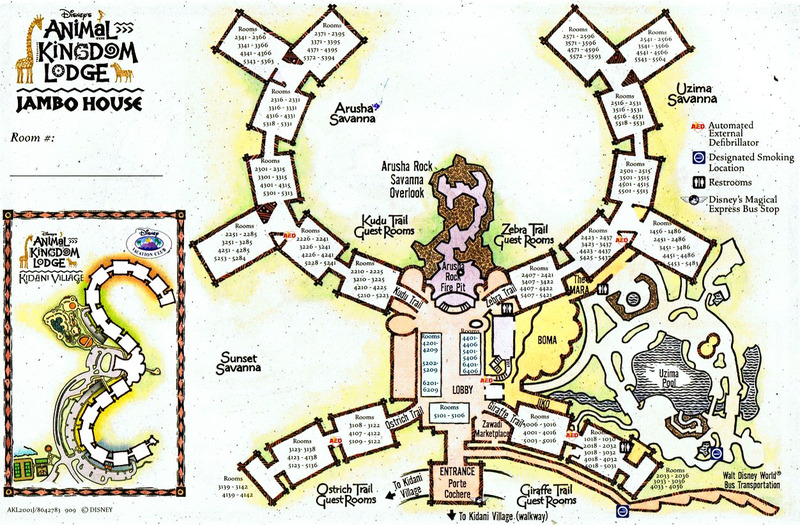 Uzima Springs - "The Watering Hole" - Here you can quench your thirst with a variety of frozen African specialty drinks. This relaxing pool bar is the perfect place to pull up a chair and take a break from the sun. Open 10:00 a.m. to 9:00 p.m. Private Dining - Room service is available from 6:00 a.m. to 12:00 midnight. You may even pre-order from the menu and enjoy a breathtaking sunrise or sunset on your balcony. Touch DINING OPTIONS on your guest room telephone. Maintain your fitness schedule with the latest in exercise equipment. And don't leave out the pampering spa services featured here, such as facials, body treatments, and an array of massages. Saunas and steam rooms are also available. Note: There is a fee for use of the Fitness Center. The Fitness Center is open from 6:00 a.m. to 9:00 p.m. Massages are available from 8:00 a.m. to 8:00 p.m. Touch MASSAGE/HEALTH CLUB on your guest room telephone. Test your skills on some of the newest video games available, as well as some legendary arcade favorites. Located next to the Mara Restaurant, the arcade is a challenge that can't be missed. Kids love the activities here. Children 4 to 12 years of age are supervised and treated to classic Disney films, and Arts and Crafts, among other activities. Reservations should be made 24 hours in advance. Touch DINING OPTIONS on your guest room telephone or call 407-WDW-DINE (407-939-3463). Hours of operation: 4:30 p.m. to 12:00 midnight. Zawadi Marketplace celebrates the colorful world of African art and culture. Here, you can find memories of your journey and observe native artisans demonstrating their crafts in a rich, dynamic market atmosphere. This shopping location is an attraction in itself, with authentic artifacts and handcrafted treasures that are displayed amid natural finishes, patterns and textiles. Hours of operation: 7:30 a.m. to 11:00 p.m.
Can I pet or feed the animals? 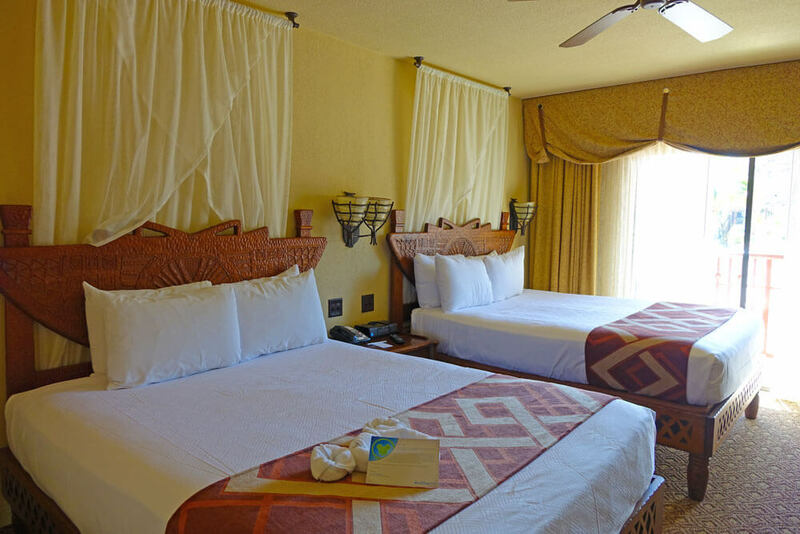 Disney's Animal Kingdom Lodge is designed to encourage observation of Africa's amazing wildlife from either the comfort of your room or common vistas throughout the resort. Animal-feeding is strictly forbidden; please refrain from feeding the animals or dropping items into the habitats. While at Disney's Animal Kingdom Lodge, please do not attempt to cross the barriers designed for guest and animal safety. If any guests attempt to harm the animals or their habitats, they will be immediately asked to leave the resort. There are three separate savannahs. These savannahs can be viewed from Sunset Overlook, an overlook near Uzima Pool, alcoves along Kudu Trail (second floor, rocking chairs, high-powered binoculars) and Zebra Trail, and the Kopje (a large observation area that extends into the savannah). 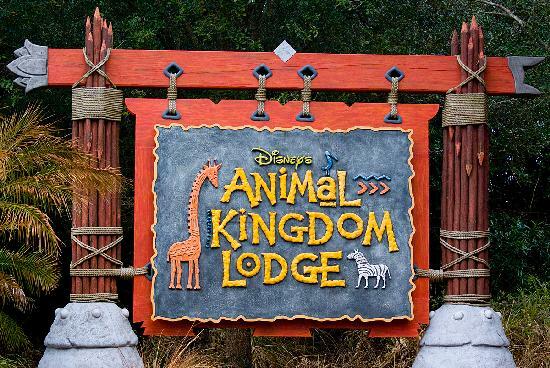 What's the address and contact info for Animal Kingdom Lodge and Villas? The hotel's address is: 2901 Osceola Parkway, Bay Lake, FL 32830.
martinem0428, Dinah Reece, vinotinto and 3 others like this. MICKEY'S DREAMERS WDW or Hawaii? This is the question! WOW !! So exciting !! We will visit beautiful AKL this August !! Can't wait !! sunset7132 and dolphingirl47 like this. Jumping in on the new thread early. I'll be there in May...we visited it for the first time last week for lunch and were blown away by how gorgeous it is. Can't wait for my first stay in a few months. beck00, deide71, dgagnon519 and 4 others like this. ...you are going to love it! dgagnon519 and cassie58 like this. Hey Kim, how are you?? LONG time since I've been around here!!! Hope you had an amazing Christmas!! New Thread looks awesome!!! ....how old is your DS now? Awwww, I still haven't gotten myself any of those glasses............. I need to fix that!!! LOL - He is 17 now, driving and pretty much grown...... time flies!!!! How are all your kiddos?? So all your boys are at home?? Didn't one get married? Are you on FB?? I talk to Brandi, Elin, Laura and a few others there a lot!! I see you guys might go in April....... we're headed back for Mardi Gras, was lucky enough to get the Poly!!! We were just there for Halloween for 12 days, Kris came over from Hawaii, it was the grandbabies first trip, they LOVED it!!! They LOVED Kidani and all the animals!! It was really good talking to you, gotta run. I'll try to get back so we can catch up some more!!! Hugs my friend! JohnDaleswife Sharing the same birthday with Donald Duck! Why do they not offer late check out here? .....what I MEANT was that yes, they are still at home, and no, none of them are married....also, I don't know if you remember my brother, who had a lot of health issues - he passed away July of 2015. ....they did, a few years back, but the recent info that I was able to obtain was that, no, there is no late check-out available. However, the policy could have changed again [of which I am not aware] and it might be offered again. I suggest checking with AKL directly....good luck - hope that helps!